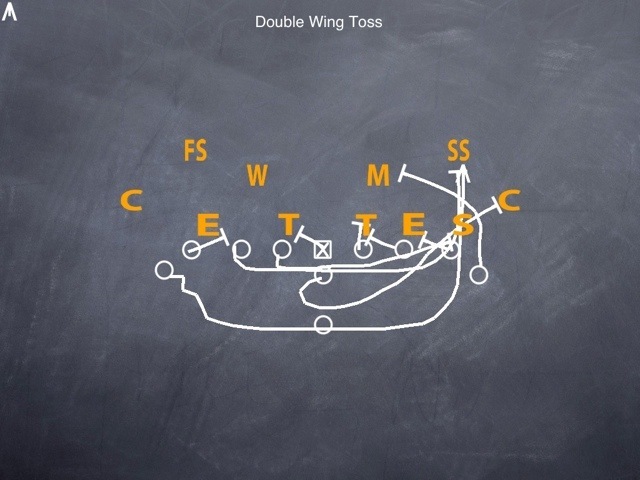 But as my first website grew in popularity, I started getting a lot of questions on how to adapt to defend the Double Wing. The offense presents a special problem for you when you are in an area dominated by Spread Offenses. A while back I sprung for Jerry Vallotton’s Double Wing book, The Toss. I never thought I would say it, but for $40 this book in PDF format is under-priced. If you are like me, you get everything on instant download to your iPad or Kindle so patience is at a premium, plus the download was $10 less than the hard copy. Let me just say, it’s a good thing I am not our Offensive Coordinator, or I would be installing the Double Wing Offense right now. It is simple, and absolutely brutal on a defense. 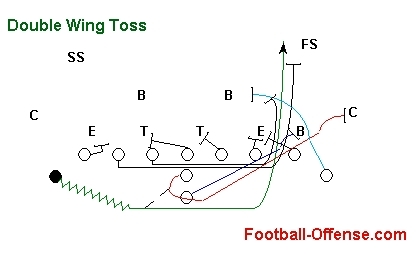 What Coach Val calls the Toss Play is also known as the Double Wing Super Power, and is the devious starting point to this power running offense. The play is all about outnumbering your defense at the point of attack. You can see the number of bodies getting there. Let’s talk about how to do it. We will start on the play side with the front side Tight End. He will down block on the first man inside of him. He knows that a player head up or outside of him is going to be kicked out by the fullback. The front side Tackle handles post for a double team with the TE against an Even Front, and down blocks on the 3-tech for an Even Front. The Guard on the front side is the drive man in a double with the Center versus an odd front, and will down block or go to the inside backer versus even fronts. If the Center has a head up nose, he will post for the double, as mentioned. 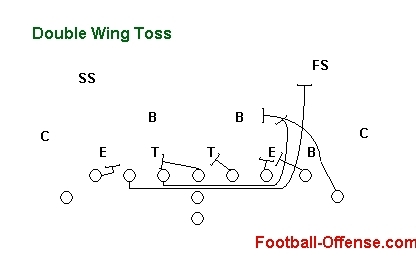 If the defense is an Even front, he will block back to replace the pullers. The backside Guard pulls and rolls the hole, tight off the down block. He looks to seal anything leaking overtop, or goes up to the Safety if he sees nothing inside. The backside Tackle will pull and look to clean up any leakage on his way to the point of attack. If he picks up nothing, he turns up in the hole, tight off the down block to get in the wall of blockers. The backside Tight End will come down to cut any defender over the pulling Tackle. The Wing Back on the play side is going to step down as if he will down block the DE, but instead turn inside to handle a scraping inside linebacker. The backfield of the Double Wing features a QB under center and a Fullback very tight to the QB, to help his angle on the kick out block he executes on this play. He will kick out the Defensive End head up to outside the TE. The Wing on the back side comes in motion on the QB cadence. On the snap, the QB reverses out and tosses the ball to the wing. It should be a soft toss, easy for the back to handle. The path of the wing should be flat, until he sees the opening. Then he puts a foot in the ground And gets through the opening now. There has been some change in the role of the QB. Some coaches would have him continue his spin after the toss and turn up to get in on the blocking. It is more common today for him to boot out after the toss to hold the safeties and corners. Double Wing coaches like Coach Val point out that this is a play designed to simply get 3.5 yards per carry. But big plays do happen! And when the defense starts to overcompensate, you hit the with the Sweep, Trap, or Counter for more gains.